New York City may not have the long history of other great cities of the world, but I l love walking through lower Manhattan, taking in the buildings that practically whisper their secrets. I often gravitate towards history books on the subject of old New York, but this post was actually inspired by a book on the history of a British tea store that I was recently perusing. I was flipping through the book and read a mention about 'tea gardens' and how they were so popular in London in the early 1800s that Americans started creating them in NYC. Naturally I started researching these tea gardens, and learned a bit of interesting tea history more colorful than I would have ever anticipated. It's fun to take a small step away from the leaf and learn from the history books. Tea gardens began in London and were a place for entertainment and refreshment. They were areas to socialize, have a lovely (and socially acceptable) walk, and basically be seen by everyone in society. The landscaped gardens offered an oasis from the congestion and aroma of London in the 16th century. There was entertainment such as dancing, performances, lawn bowling, even balloon rides. Of course there was also tea and food. Mozart was even documented as performing at one of the popular tea gardens. It must have been quite the scene, to promenade in your finest dress and take tea in one of the manicured alcoves. I find it interesting that all different social classes congregated in the tea gardens. The gardens were given the name 'pleasure gardens' due to the immense amount of leisure activities available. Over 200 tea gardens existed in London between the early 16th to the 19th centuries! Not surprisingly, there is a book all about the London pleasure gardens, called The London Pleasure Gardens of the Eighteenth Century. So if you're interested in learning much more than I can explain, check it out. Given the popularity of the British tea gardens, they naturally spread to New York. In the 1700s tea gardens sprang up throughout lower Manhattan and were named after the popular British tea gardens such as Vauxhall and Ranelagh. They featured landscaped grounds, and elaborate fountains just like their British counterparts. 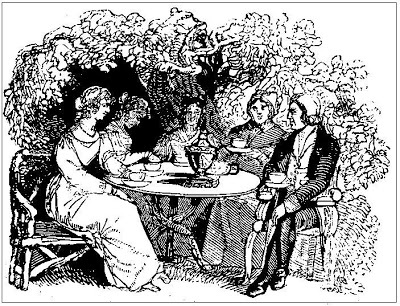 The tea gardens became popular places not only for gathering and amusement, but also for courting since it was a socially acceptable place for women to socialize. In the summers there were also theater performances of all different kinds and many gardens known for their fireworks displays. Sounds a little bit like Disney World, but with more tea! I fell down a bit of a rabbit hole researching tea gardens and ended up going as far back as the installation of water pumps around New York City, before the large upstate reservoir system was created in the late 1800s. Before the reservoirs were created, well water was iffy and best. This line from the book Chronicles of Old New York: Exploring Manhattan’s Landmark Neighborhoods explains the situation fairly well, "For nearly 200 years, New York's water was so putrid even horses wouldn't drink it, and drunkenness couldn't be reprimanded since so many people had to mix spirits with their water just to swallow it." There was some water pumped from springs in the area, and this water was obviously considered superior. I was excited to find out that the best pumps were called 'tea water pumps'. Of course, tea was very expensive at the time, so only the finest water could be used to brew up a satisfactory pot of tea. Water for tea (and I suppose for drinking and cooking) was sold from the pumps tapped into the spring water. You could purchase water at the pump for a few pence, or have 'tea water men' bring the water right to your door for a penny a gallon. An outdoor area for recreation and gathering sprang up around one of the popular tea-water pumps, and became one of Manhattan's first parks. In the book I also learned the tea water caused quite a scandal. 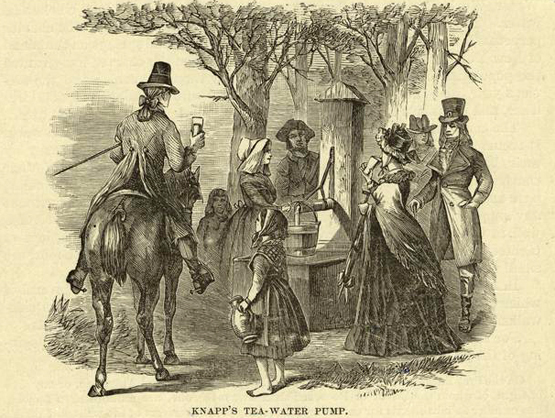 Just like today, shady folks figured out how to corrupt the system, "Tea Water was the only drinkable water in town, but was controlled by a group of thugs who made outrageous profits and whose wagons, waiting their turn to pass under the pump blocked traffic for a mile in all directions. Something had to be done about the water situation." The book goes on to document how none other than Aaron Burr ("Pardon me, are you Aaron Burr, sir?") proposed a clever, but corrupt plan to bring water from the tea water pumps to citizens through wooden pipes for an outrageous subscription fee. Of course, there is much more to say about the history of water circulation (and Aaron Burr) in NYC, but that's not for this blog post! I apologize if this post made you a little bit sleepy, but I find NY tea-related history quite interesting! There is much more information about tea gardens in the book A Social History of Tea by Jane Pettigrew and Bruce Richardson. I hope to start learning more about the history behind tea. There is fascinating information on how tea culture spread throughout the countries of the world. Now I just have to find the time to read every book I can get my hands on! This is such a rich post, Sara. I enjoyed it. Wouldn’t it be interesting with all the specialization happening in the tea industry if someone created a bottled tea water? !